LONDON 26 October 2011: Irisys has added new models to its highly successful IR16D thermal imaging camera range for mechanical engineers. It has also added new functionality to its flagship camera, the IR16DS. Mechanical engineers commonly use thermal imaging cameras to check the condition of plant, equipment and HVAC installations. Whether conducting routine preventative maintenance or investigating a specific fault, the IR16D thermal cameras allow quick analysis of bearing condition and poor motor shaft alignment, pinpointing faulty electrical connections and inspection of containment vessels and ducts. The IR16DE is designed for use by both thermographers and electrical maintenance engineers. High quality images can be captured and manipulated in the camera, allowing problems to be resolved on the spot. 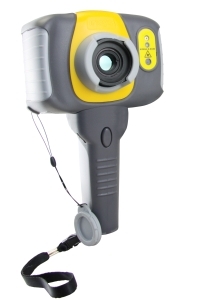 The picture in picture feature allows the thermal image to be displayed within a wider visible picture, aiding location of a faulty bearing or item of plant. Images can be downloaded to a PC for analysis and reporting. The camera comes with an industry leading 3 1⁄2” display, providing clear images in difficult locations. An LED illuminator allows the visible camera to function in low light environments. Typical applications for the IR16DE include mechanical and electrical inspections, predictive and preventative maintenance, process monitoring, HVAC & R troubleshooting and maintenance, and general industrial and domestic inspection. The new IR16DS has all the features and functions of the IR16DE with the additional capability of multiple viewing options, fully fused thermal and visible images, alarms, and sequence recording. The new model allows measurements from -10°C up to 500°C. Two other models in the IR16D range are designed for building maintenance applications; and for high temperature areas such as furnaces. The feature-rich IR16D range, designed for engineers on the move, was launched in 2010. The cameras are already bestsellers all over the world. Each camera in the range can store over 1000 images on a micro SD card. Engineers can add voice notes to each image and play them back through the camera’s speaker or through a PC, saving time and effort compared with manual note taking. “The cameras will appeal to mechanical and maintenance engineers who recognise how easy-to-use and highly accurate thermal imaging technology can provide effective condition monitoring to identify plant maintenance requirements in advance, so preventing expensive breakdowns and outages,” said Andrew Rimmer, Divisional Director – Thermal Imaging at Irisys.